De’Andre Hunter hit the biggest shot in UVA basketball history on a pass from Ty Jerome. On Monday, Hunter deferred to Jerome to make the first declaration regarding the 2019 NBA Draft, before joining his teammate in the draft pool. “Being at the University of Virginia has been an amazing experience. From being a redshirt to winning a national championship, the journey has been unbelievable,” said Hunter, a third-team AP All-American in 2018-2019, who is projected to go as high as fifth in the June NBA Draft. 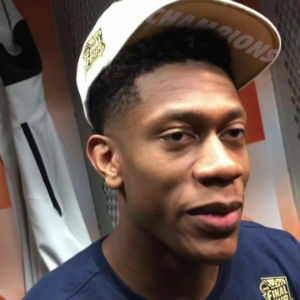 Like Jerome, Hunter made his declaration known in an Instagram post featuring a slickly-produced video with career highlights and Hunter thanking fans for their support. “Winning a national championship has always been a dream of mine and accomplishing that with this team is something I will never forget. Thank you to all the fans for your tremendous support. You guys will always be in my heart,” Hunter said. Hunter scored 27 points in the national-championship game win over Texas Tech last week, including that game-tying three with 12.9 seconds left, and then the eventual go-ahead basket in overtime, also a three-pointer, with 2:09 to go. Hunter was also the NABC National Defensive Player of the Year and ACC Defensive Player of the Year in 2018-2019. As a redshirt freshman in 2017-2018, Hunter was named the ACC Sixth Man of the Year. A 6’7” guard, Hunter can guard one through four defensively, and he brings equal versatility on the offensive end, effective in the post (shooting 52.0 percent on two-point field-goal attempts, and 68.6 percent on shots at the rim) and on the perimeter, shooting 43.8 percent from three-point range.